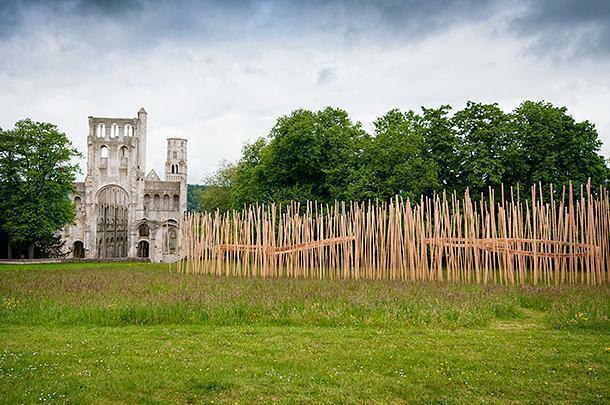 We first encountered Jumièges Abbey rising out of the trees across the river Seine. We had parked our motorhome at a small dairy farm for the night and watched, mesmerised, as huge barges motored by on the river. But the barges weren’t the most impressive thing we could see from our window. That title was awarded to the two huge towers crowning the enormous white church in the distance. We knew we would have to go take a look at this impressive structure in the morning. As our motorhome was too large to fit on the little ferry that runs from Heurteauville to Jumièges, we took the long way around the snake-like Seine and over the towering Pont de Brotonne, constructed high into the air, to allow plenty of clearance for the giant barges we watched throughout the evening. 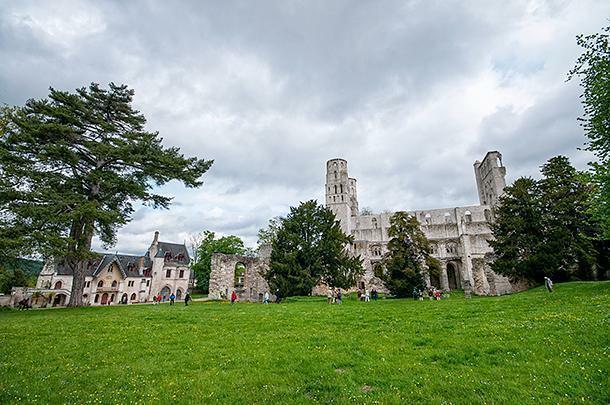 The town of Jumièges is tiny and seems to hunker around the immense stone abbey. Luckily Jumièges hasn’t succumbed to selling out to the tourist trade and remains pretty and relatively devoid of tacky clichés. 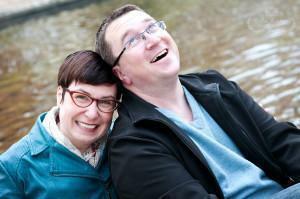 We parked up and wandered through the gate surrounding the abbey, where we purchased our tickets at the abbey shop. It’s not until you are standing in front of the church, you realise it’s not all there. From a distance the vast white structure looks solid and intact, but Jumièges is a ruin. In fact, it was known as ‘the most beautiful ruin in France,’ by 19th century writers. 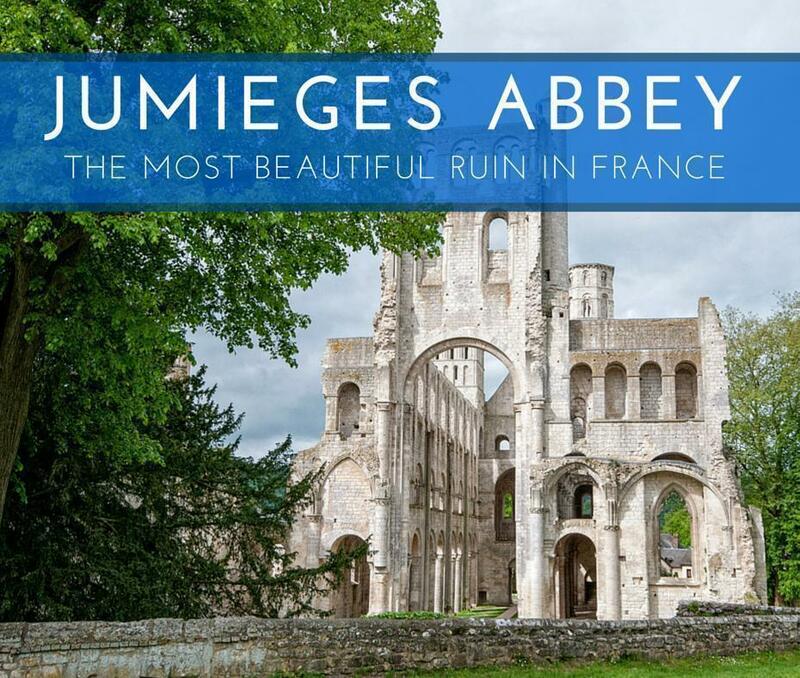 And while we haven’t (yet) seen all of France’s ruins to compare, Jumièges abbey is definitely picturesque. 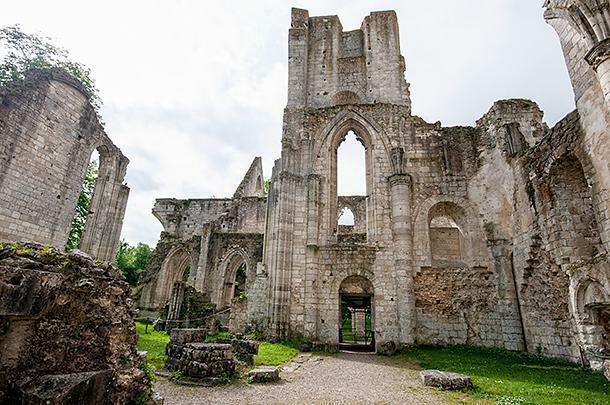 The abbey was founded in 654 and, surviving Viking invasions until 940, it grew and prospered, becoming famous for its scriptorium and beautiful illuminated manuscripts. Like many abbeys that evolved over centuries, Jumièges is a hodgepodge of architectural styles. The 14th century gatehouse is gothic and neo-gothic, having been modified in the 19th century. 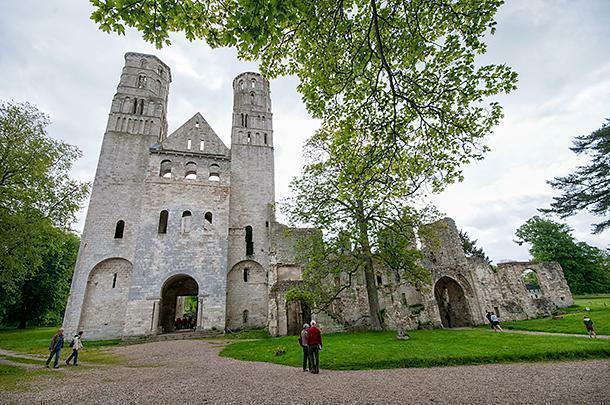 The 11th century abbey church (of Notre Dame) is a stark and imposing Normandy Romanesque. The two towers reach 46 metres into the air and standing inside the now roofless church, it seems as though they are reaching for the sky. The scale is awe inspiring. 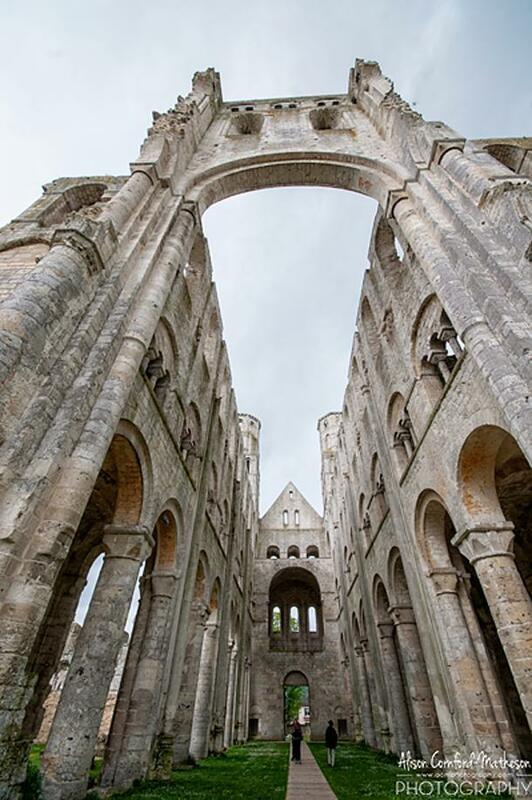 Walking through the ruined church, we couldn’t help but think of our favourite ruin in Belgium, the abbey of Villers. Although much smaller in size, Villers’ gothic architecture feels more welcoming and less austere than Jumièges. 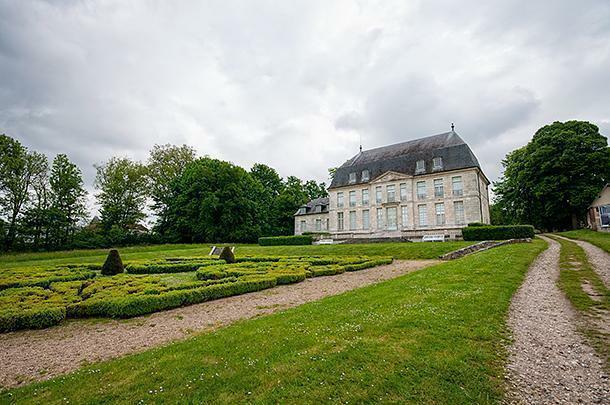 Jumièges also sits on a substantial piece of land and is surrounded by 15 hectares of land. 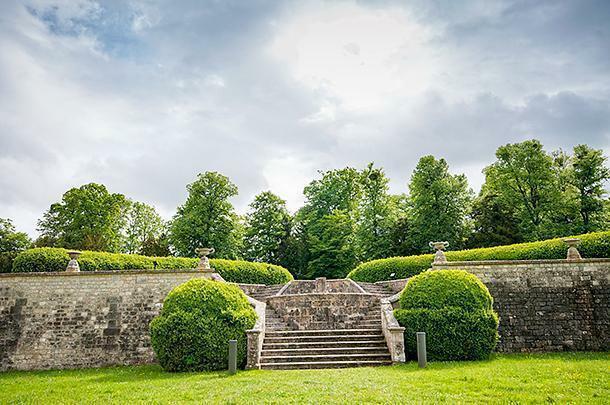 There is a 19th century landscape garden, which offers a quiet vantage point to admire the ruins. These days, modern sculpture contrasts with the ancient architecture. Each year, a new work is displayed for the summer months, with a few of the most popular being kept permanently. Inside the modern lodge are temporary exhibitions. Behind the abbey is the logis abbatial de Jumièges. This much more modern space is used to house exhibitions. During our visit, was a display of photographs of Beirut in the 1990s – a completely different kind of ruin. Wandering through the ruins is a beautiful way to spend the morning. 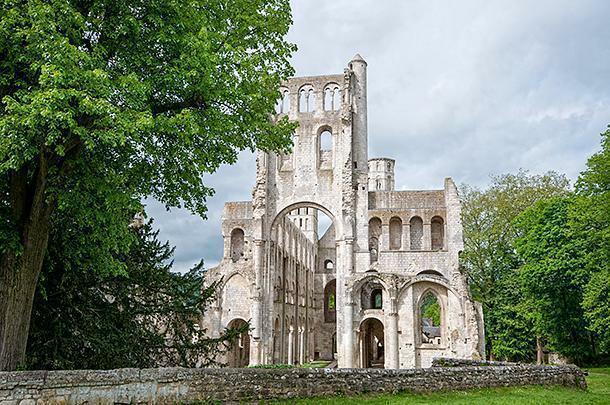 You can visit Jumièges abbey on your own, with leaflets printed in several languages, or as part of a guided tour. A self-guided visit takes about an hour. The surrounding town has a number of nice cafes and tea-rooms so a morning visit, followed by lunch is an ideal way to spend the morning. 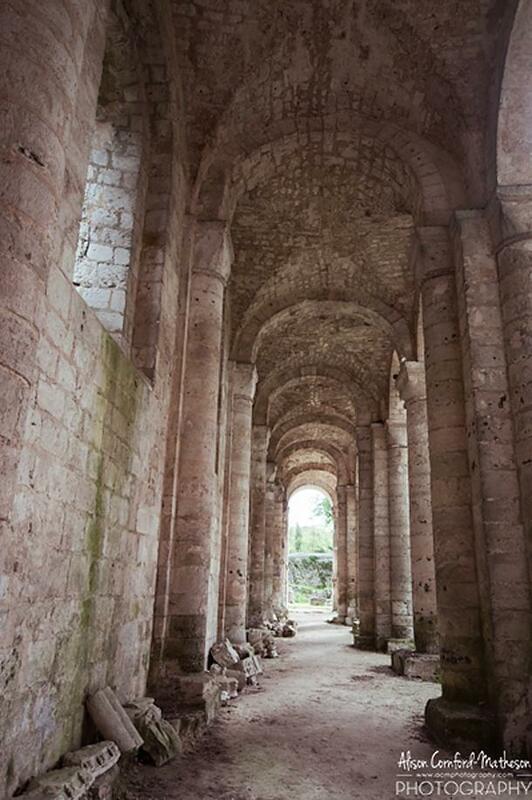 We don’t know if it’s the most beautiful ruin in France, but we’re willing to be convinced! 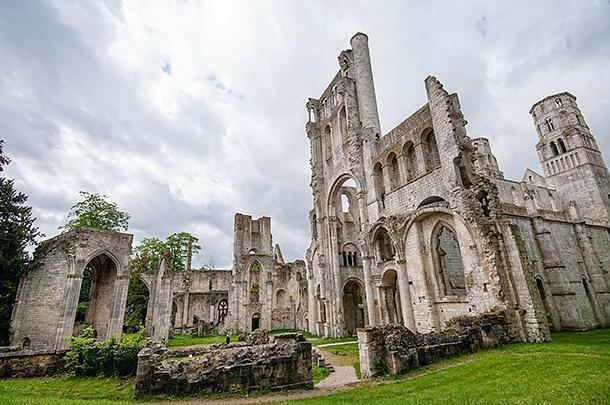 While Normandy may be best known for its D-Day monuments and its wonderful smelly cheeses, there’s plenty more to see and do in the region. 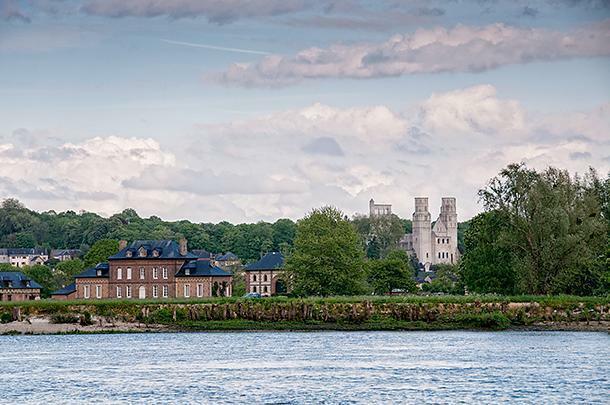 Jumièges Abbey is well worth the detour, into the green heart of the Seine-Maritime département.